News | GAMCO Investors, Inc.
Gabelli Portfolio Manager Robert Leininger discusses the outlook for both U.S. equities and deal activity. 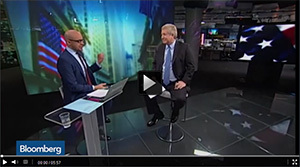 He speaks with Jonathan Ferro on Bloomberg Television's "On The Move." Mario Gabelli is an investment legend and he’s just launched a new fund in London. Smart investors should get onboard. Although virtually unknown in the UK, but with a record of long term outperformance in their native USA, Gabelli has succeeded in breaking through the important £100 million mark in its float on the London Stock Exchange. The Gabelli Value Plus Trust (GVP), run by Gamco Investors, the New York-based activist fund manager, has raised £100 million at launch. The Gabelli Value Plus trust is to list on the London Stock Exchange on 19 February after a fundraising period described by Numis analysts as “a considerable success”. Experts have warned that a new US investment trust coming to the UK market may struggle to get off the ground. investment trust that will invest in US equities. Gamco Investors, the New York-based activist fund manager, has hired Witan (WTAN +) chief executive Andrew Bell to chair its first investment trust in the UK. The firm is looking to raise up £250 million for the Gabelli Value Plus Trust and hopes the presence of experienced investment trust board and an innovative approach to the US will appeal to UK investors. Gabelli Value Plus+ Investment Trust is seeking to raise up to £250 million to bring their successful ‘Private Equity’ approach to stock market investing to UK Investors. Andrew Bell the Chief Executive of Witan Investment Trust will Chair the new trust, which has also attracted the former Chair of Aberdeen Asset Management Charles Irby, and Alex Hammond-Chambers who Chaired Ivory & Sime, the esteemed Scottish Asset Manager now part of F&C, who currently Chair’s Hampden & Co, and the soon to launch private bank. TWO grandees of Scotland’s investment sector have joined the board of a trust that is aiming to raise up to £250 million when it lists on the London market next month. Charles Irby, a former chairman of Aberdeen Asset Management, is to serve as a director of the Gabelli Value Plus+ Trust, which will be pitching to Scottish investors this week ahead of its planned listing. US fund manager Gamco Investors is set to launch a UK-listed closed-end fund investing in US equities and aiming to raise between £100m to £250m. The Gabelli Value Plus+ Trust will be managed by Gabelli Funds and is due to begin trading in February on the London Stock Exchange under the symbol GVP. Outgoing AIC chairman Andrew Bell is to sit as chair on the proposed launch of a new US equity investment trust managed by US-based Gamco Investors. The Gabelli Value Plus+ Trust will be managed by Gabelli Funds, which is a subsidiary of Gamco. The fund is looking to raise between £100m and £250m and is anticipated to begin trading next month on the London Stock Exchange. GAMCO Investors is to launch a UK listed closed-end fund, The Gabelli Value Plus+ Trust (the Trust), to invest in US equities. The Trust will be managed by Gabelli Funds, LLC and is targeting a fund raise between GBP100m and GBP250 million. As part of the offering, GAMCO Investors, Inc will invest 10% of the total capital raised in the issue and it is anticipated that the Trust will begin trading in February on the London Stock Exchange under the symbol GVP.